Previously I posted the test results for my comparison of internal vs external sensor TPM systems. The weather was cool to cold back in March. Now I can report the results with the ambient in the upper 80's. I was driving 65 mph with cruse on a level stretch of Interstate. The Sun was fully on the left side of the RV. These results tend to match the previous runs with the internal reporting about 30F hotter than the external sensors. Again I do not consider the results of a comparison between the temperature readings to be "meaningful" in the sense that the internal sensor numbers are useless. Suggestion: If you have an external sensor TPMS I would continue to use that system. Just be aware that the temperature readings are probably in the range of 27 to 40 F cooler than the temperature readings your friend would be getting with their internal sensor system. If you are concerned you could change your High-Temperature warning level with your external sensor system from the factory 158°F to about 145°F. Just be aware that if in Phoenix or Death Valley or other location where the Ambient exceeds 120°F you may get a high temp warning. If you do just pay attention to the pressure readings to be sure you are not losing any air pressure. Since tire temperature is also a function of load and speed you might bump up the High-Pressure warning level 5°F till you are not getting a warning simply because it is hot outside. Of course, it might also help to slow down a bit as that will also result in lower tire temperature. There is a difference between temperature readings based on sensor location. BUT this does not automatically make one type of system better or worse than another. 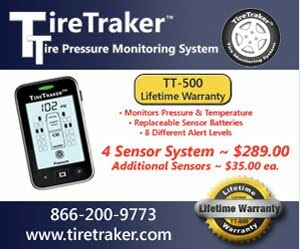 As I said in THIS post I am not a fan of TPMS temperature readings no matter which type sensor you run.